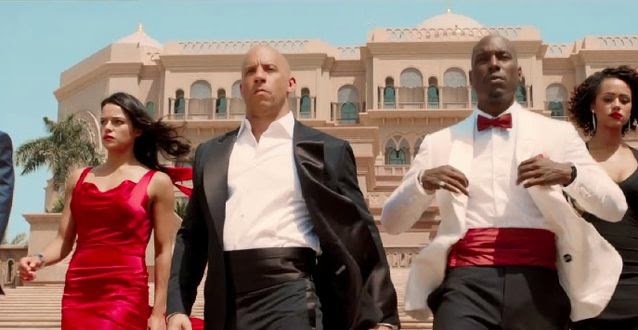 Kiss My Wonder Woman: Is 'Fast and Furious 7' a Good Movie? Should It Be? 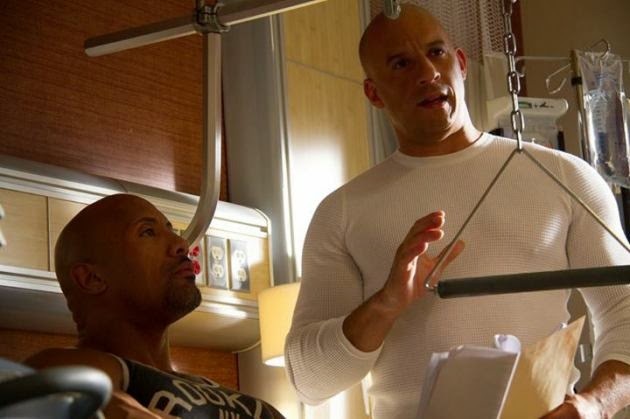 Is 'Fast and Furious 7' a Good Movie? Should It Be? As a friend recently pointed out to me, I have confusing taste in movies (and most forms of pop culture). On the one hand, I really adore interesting, artistic, frequently foreign and baffling, pieces that serve as critiques of mainstream art and experience. Some of my favorite films are German art-house cinema or existential horror pieces or other films that are virtually unwatchable to people who aren't me. And then there's the stuff that's just good that I like because it's good, where my taste coincides very neatly with the general consensus of the world. But there's also a third category of films I like, and this one seems to be the most baffling to people: schlock. I love schlock. I love weird dumb movies with melodramatic lines, tons of explosions, poetic declarations of love at the exact worst moment, and fire-y chase scenes through space or Los Angeles or whatever. I love ridiculous movies just as much as love obscure art films and your average classics. How? What do all of these things have in common? What is the defining feature of a movie that I love? I love movies that are unabashedly earnest about their intentions. I don't like movies that are too cool for school, what I want is a film that is desperately passionate about its subject and would like to tell me about its favorite things for two hours. I want a movie that cares so much it makes me cry in a dumb action movie. I want a movie that begs me to invest myself emotionally and promises that even if it isn't a transcendental experience, it will change me. In short, I love movies that want me to love them and don't care if I know. I bring all of this up because on Saturday morning I found myself sitting in a darkened movie theater sobbing quietly to the ending of Fast and Furious 7 and trying to decide if I was embarrassed or not. On the one hand, I was literally openly weeping during the credits of a movie that stars Vin Diesel and Michelle Rodriguez, the two actors I most want to impress. * On the other hand, I wasn't moved to tears by emotional manipulation or feeble-mindedness or something, but by genuine human emotion being expressed in a sincere and earnest way. And while, yeah, it did feel a little silly to be crying during the credits of a movie that features a scene where they jump a car between three different sky scrapers and another scene where they parachute cars onto an obscure highway in Azerbaijan, I was crying because my feelings for the characters in the movie were so real, and those characters were so openly emotional, that all my feelings just came bubbling up through my eyes and there was no sense trying to hold it in. Which brings me to my larger point here, that of whether or not we can call Fast and Furious 7 a good movie. I mean, it's clearly a movie that I like, but my taste has been called suspect in the past. And it is the seventh film in a franchise best known for being about fast cars, pretty women, and big explosions. By most objective standards, aka, snobby movie critic standards, Fast and Furious 7 should be a pile of crap. But it isn't. It isn't because it does exactly what I have been asking action movies to do for years: it cares. It's not that I don't generally like action movies, but more that I object to the way they're usually done. If my favorite type of film is one where the cast and crew are in earnest about the film they're making, my least favorite type of movie is one where the cast and crew have completely abandoned all notion of character development and emotion, and prefer to just make a movie with as many explosions, car chases, and shootouts as possible. I hate movies that don't want me to be emotionally invested in their characters, because without emotional investment what is the point of a story? 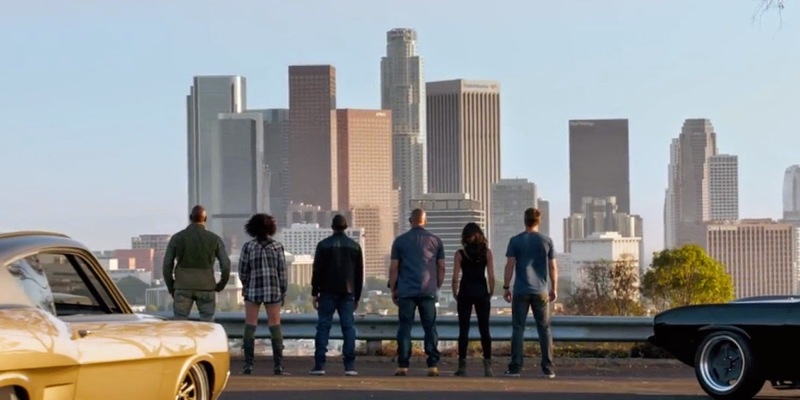 The Fast and Furious films might not always be the most clearly plotted, logical, and sane films in the universe but they are absolutely about character development and emotional investment, and so I love them. The franchise that started with an undercover cop, Brian (Paul Walker), infiltrating a gang of illegal drag racers led by supreme badasses Dom (Vin Diesel) and Letty (Michelle Rodriguez), has morphed into a sprawling world of terrorists and paramilitary organizations and crime syndicates. Our bad guys from the first film have become globe-trotting vigilantes, saving people and nice cars from the big bads of the world. And while some of the plots are more ridiculous than others, the reason this whole mess has stayed cohesive is because the core of the movies is never about their outlandish plots, but entirely concerned with the characters and their relationships to each other. As the franchise has gotten bigger, the addition of more characters hasn't made it feel looser or less engaging, but has instead gotten us all even more invested in them all and made the stakes even higher. In addition, there's always been a sense that the people making these films really love them - why else would they keep making them for thirteen years? Which is why, at the end of this film, when the characters' stories were resolved and your heart was already full, an emotional goodbye to the franchise star who passed away during filming (Paul Walker), said by people who really loved both him and his character, done with absolute sincerity, made me cry my eyes out. I suppose at some point in this review I ought to tell you what the movie is about, but I'll be honest. No one I know goes to see a Fast and Furious movie for the plot. You go because over the course of seven films, these people who love each other so much have become your family too, and you want to honor them and see what happens next. But for the doubters in the audience, I will indulge you. The film picks up after Fast and Furious 6, with an angry Deckard Shaw (Jason Statham) killing Han (Sung Kang) for his role in crippling Shaw's brother. He then sends a bomb to the house in LA where Brian and his wife (Dom's sister) Mia (Jordana Brewster) live. Dom also might live there too, but it's unclear. Either way, it's an adorable scene of domesticity until Shaw blows it all up. Fortunately, none of them are hurt, but it's clear that Shaw is on the warpath and he won't be stopped. Also in the wake of the last film, Letty is still trying to get her memories back, having been killed a few movies ago and then found, with amnesia, last installment. She knows that Dom loves her, but she remembers almost nothing about her life. Just that these people are good to her, care about her, and she's really awesome at driving fast cars. The whole group of them - also including Tej (Ludacris) and Roman (Tyrese Gibson) - go after Shaw, but they make pretty much no headway until a covert operative called Mr. Nobody (Kurt Russell) makes them an offer. If they can retrieve a hacker named Ramsey (Nathalie Emmanuel) from some nasty terrorists (led by Djimon Hounsou), then Ramsey can let them use God's Eye, a program she made to use cell phone cameras and CCTV to track anyone anywhere on the planet. They can use it to find Shaw. And then there are explosions and car chases and people being angsty at each other and mostly Brian trying to figure out if he really wants a life this dangerous when he's got a wonderful wife at home and a son and another child on the way. I could go into more details about what exactly happens, but why? It's not why we watch these movies. No, the reason we watch is because in between explosions and ridiculous car feats, we get to see these characters show how much they care about each other. All of the central plots of the film are about family and protecting the people you care about. Even the bad guy is doing what he's doing out of loyalty to his family, and you can understand where he's coming from. A movie for me is more than a plot or an arc or a well-written script. I like all of those things, don't get me wrong, but I like some other things a lot more. I like family. I like heart. I like characters who feel things deeply and don't apologize for that. I like the fact that in a movie this potentially testosterone-driven, Dom allows himself to be unabashedly sentimental. He cries. They all do. They all care about each other and refuse to apologize for that. I mean, it's also worth noting that far from being a paean to macho strength, the Fast and Furious movies are generally some of the most diverse and gender representative mainstream films out there. The casts are very diverse, of course, but so too are the bad guys, the incidental villains, the characters in the background, everything. And while there are totally scenes of male gaze fantasy, there are at least a couple of female gaze shots thrown in there too. Plus, Letty is clearly as much of a badass as the others, and hopefully Ramsey sticks around too, because she is rad. But that's all frosting. For me, it comes down to this: any movie that can make me cry at the end not through emotional manipulation but through genuine heart is a movie worth watching. That's what I go to the movies for. So it may be silly and it may be ridiculous and you may not like it, but Fast and Furious 7 does everything I ask a movie to do, and I will not apologize for loving it. *Not kidding. A high five from either of them would be the highlight of my year. You may surely watch completely free movies online free of cost. They are also available to purchase. The best thing about is that while watching movies there's a choice to download movies to watch sci-fi Movies online. Putlockers a free movies streaming website to watch free movies and TV shows online without any downloading. There are no late charges and when you restore your movies, you can lease more.